The Max Planck Institute for Evolutionary Anthropology, in Leipzig, Germany, hascompleted the genome sequence of a Neandertal and makes the entire sequence available to the scientific community today. Dr. Svante Pääbo and his colleagues presented the first draft version of the Neandertal genome from data collected from three bones found in a cave in Croatia. They have now used a toe bone excavated in 2010 in Denisova Cave in southern Siberia to generate a high-quality genome from a single Neandertal individual. The Leipzig team has used sensitive techniques they have developed over the past two years to sequence every position in the genome about 50 times over, using DNA extracted from 0.038 grams of the toe bone. The analysis of the genome together with partial genome sequences from other Neandertals, and the genome from a small finger bone discovered in the same cave, shows that the individual is closely related to other Neandertals in Europe and western Russia (see Figure). Remarkably, Neandertals and their relatives, Denisovans, were both present in this unique cave in the Altai Mountains on the border between Russia, China, Mongolia and Kazakhstan. In the 2010 draft version of the Neandertal genome, each position was determined, on average, once. In the now-completed version of the genome every position was determined on average 50 times over. This allows even the small differences between the copies of genes that this Neandertal individual inherited from its mother and father to be distinguished. Today, the Leipzig group makes the entire Neandertal genome sequence available for the scientific community over the internet. "The genome is of very high quality", says Dr. Kay Prüfer, who coordinates the analyses of the genome in Leipzig. 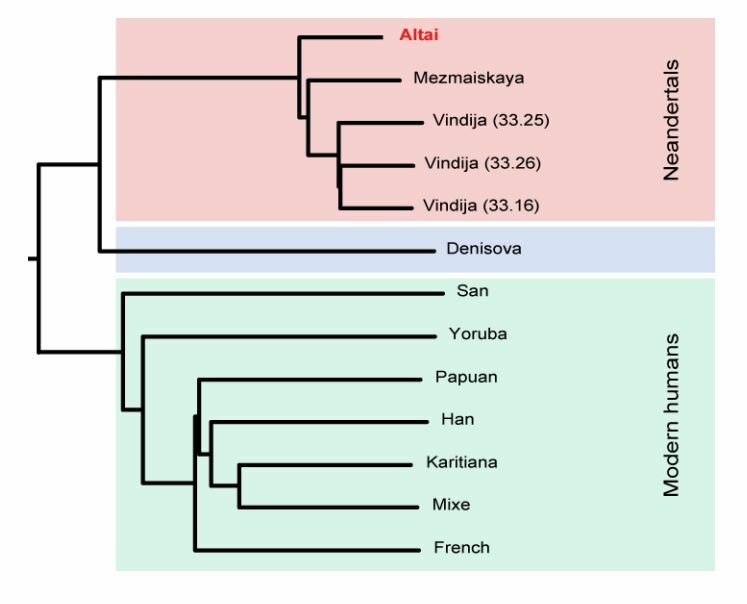 "It matches the quality of the Denisovan genome, presented last year, and is as good as or even better than the multiple present-day human genomes available to date." "We are in the process of comparing this Neandertal genome to the Denisovan genome as well as to the draft genomes of other Neandertals. We will gain insights into many aspects of the history of both Neandertals and Denisovans and refine our knowledge about the genetic changes that occurred in the genomes of modern humans after they parted ways with the ancestors of Neandertals and Denisovans" says Pääbo. The group will present a paper describing the genome later this year. "But we make the genome sequence freely available now to allow other scientists to profit from it even before it is published" says Pääbo. The project is made possible by financing from the Max Planck Society and is part of efforts since almost 30 years by Dr. Pääbo's group to study ancient DNA. The toe bone was discovered by Professor Anatoly Derevianko and Professor Michael Shunkov from the Russian Academy of Sciences in 2010 during their excavations at Denisova Cave, a unique archaeological site which contains cultural layers indicating that human occupation at the site started up to 280,000 years ago.